Most of us will be out celebrating a 3 day weekend having fun enjoying our families and/or a little time off, as we should. Life is tough and we deserve it. Let’s not also forget why we have this holiday. 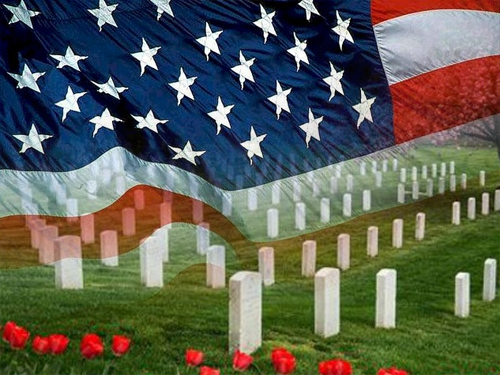 Memorial Day originally started as Declaration Day. Several states lay claim to the first Memorial Day, and there was even dissent as the south refused to celebrate Memorial Day after the civil war. While history can be fascinating, what’s even more important is the present. Memorial Day represents honoring those that have served our country. It’s always sad when some people refuse to honor certain veterans because they disagreed with a conflict or war. We owe our freedom to veterans. Our veterans didn’t get a chance to select which conflict or which war they would serve in. They just served, for us, for the United States of America, just because. They didn’t ask questions. Nobody would listen if they did. First responders at the Boston Marathon or the World Trade Center didn’t get the chance to pick which disaster they’d respond to, they just did what was needed regardless of how scarred they’d be for dealing with the scene. The same is true with our veterans. While you’re out there having fun this weekend, take a moment to visit a grave, or say thanks to an existing veteran, or just remember in your own special way. It’s the least we can do. We honor our fallen, but let’s also celebrate life. Personally I’m thankful our SW Florida real estate market is doing well. Really I’m thankful for so much more. This past week RE/MAX laid to rest one of the best brokers SW Florida has ever seen. George Sayers was loved by all and made a difference in so many lives from New Jersey to Florida. Life is precious. Celebrate precious moments this weekend with friends and family. You never know in the blink of an eye when things can change. We do not know how much time we have here on earth. All we control really is how we treat others, how we enjoy the time we have, and how we honor those that served for our benefit. So please, take a moment to thank a veteran, or a surviving spouse. Display your flag. Hug your kids. Say I love you to a loved one. Pick up the phone and call someone dear to you that you haven’t spoken to in awhile. Say all the things you’d want to say if today was your last day on earth. If that blink comes, you won’t get that chance tomorrow. Remember that our veterans didn’t always get that chance. Most were separated from their families in a foreign place. Most spoke by written mail and an occasional phone call, and they sacrificed for us. For us at home enjoying our freedom and our weekend, we have it all. It’d be such a shame not to pay some respect. Such a shame not to say things you’ve wanted to say. Remember it’s up to us to take care of each other. After thanking a veteran, the biggest honor we can bestow is to make SW Florida a better place. Enjoy your weekend, spend time with family, and honor America, a country of freedom worth fighting for! Posted in Cape Coral, Cape Coral Real Estate, Fort Myers, Fort Myers Real Estate, Southwest Florida Real Estate.Tagged Buyer Advantage Program, George Sayers, Memorial Day in SW Florida 2015.